Hard to believe that I have now posted 100 entries and that anyone has wanted to read any of it! In my last post I asked what you would do if you won the lottery. 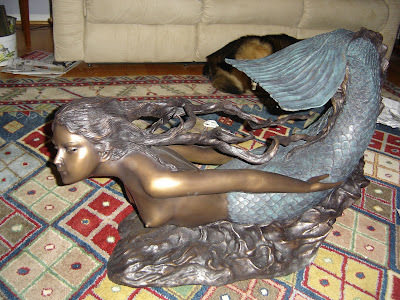 Well, years ago I always said if I won the lottery I would buy the mermaid table I saw in a shop down in Phoebus, Virginia. 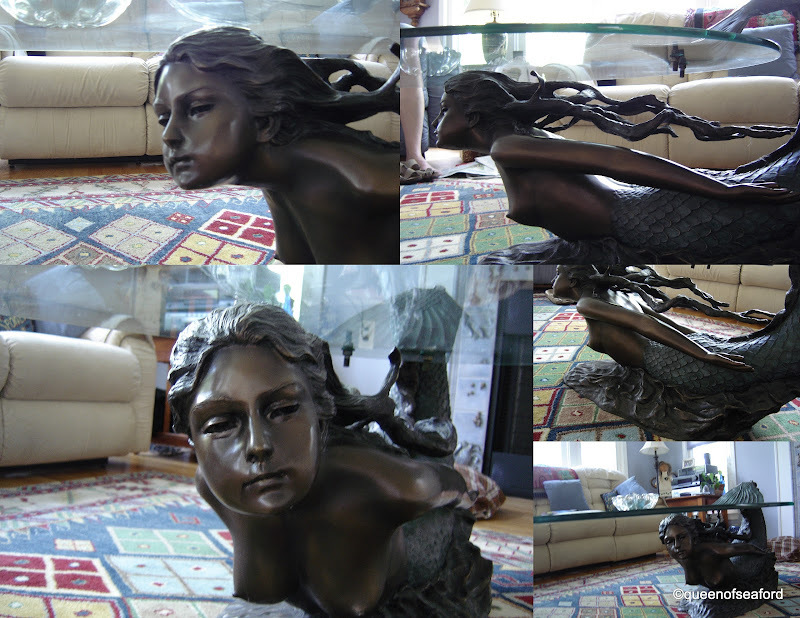 As many of you know, I did get my mermaid table, thanks to my wonderful husband! She was a Christmas/ birthday present. This past December we sent in the last tuition payment!! In celebration he bought me this great table. Some who have seen her, love her, others kind of raise their eyebrows. I love her. Lots of you asked about her name....hmmm?? I name children. I name pets. I know there are many people who name their cars, they name their plants, they name body parts (I am not going there!!!). I pondered naming her for a long time. 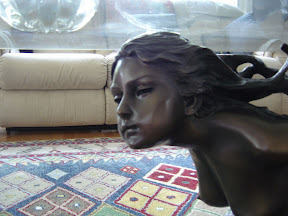 When we lived in Frankfurt Germany I heard about a siren "Lorelei" who beckoned sailors along the Rhine River. The Poem 'Die Lorelei' is very pretty. Every week when I drive to ballet, there is a sign--beckoning to me...."This is for you....Buy a ticket....Win win win!!!" 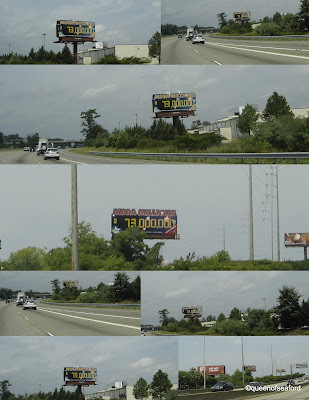 This dastardly billboard is all up and down the highway!!! NO MORE CALLS --WE HAVE A WINNER!! 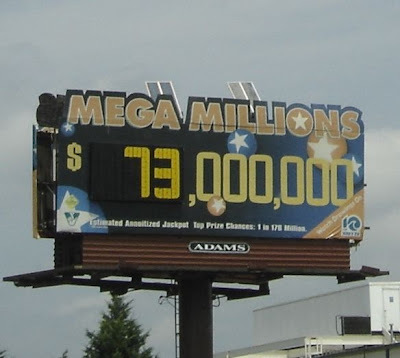 What would you do if you won $73,000,000??? One week goes by so quickly, time to explore our tree. 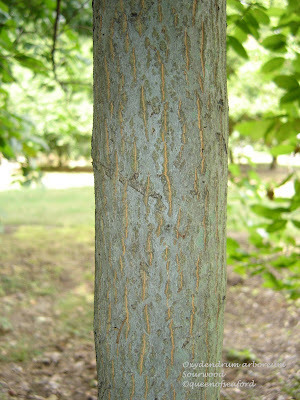 Today's tree is one I had heard of but never saw in the nurseries or garden centers. Sourwood, Oxydendrum arboreum. Last year in the Learning Garden one of the presentations we gave to a group of students included a bit on trees. Sourwood is indeed sour. Not recommending tasting things in the landscape, but this was really sour! 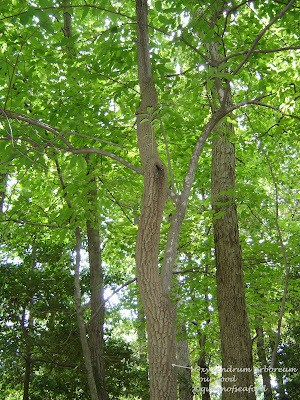 Sourwood is one of our native trees that grow in zones 5-9. A very adaptable tree, it can grow in sun to partial shade. 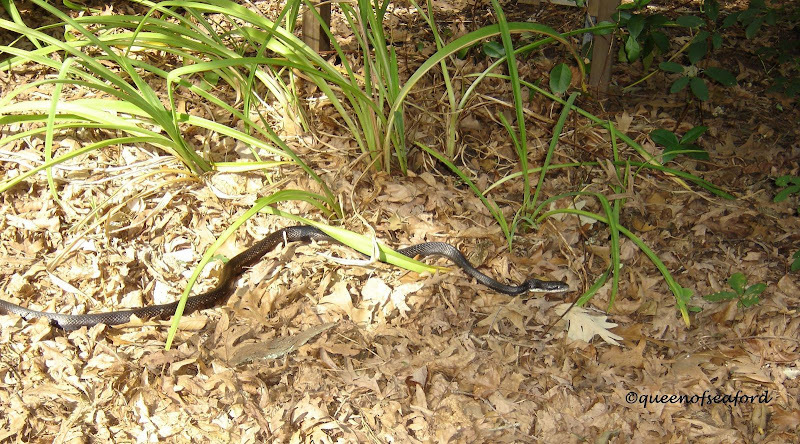 We have some in the LG --they are in the wooded areas. Not easily transplanted it is a desired tree. At maturity typically is 20- 25 feet tall and given the room, 20 feet wide, though it can reach 50- 75 feet tall. 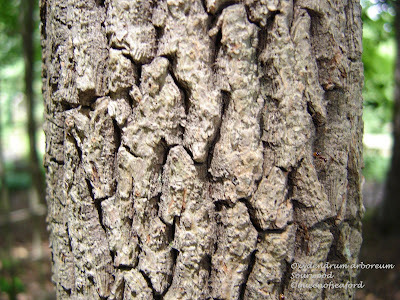 As you wander through the woods the first thing you notice is the interesting bark of this tree. Deep ridges are a bold feature of this tree. Even on a young tree the beginnings of this interesting bark are getting mapped out. 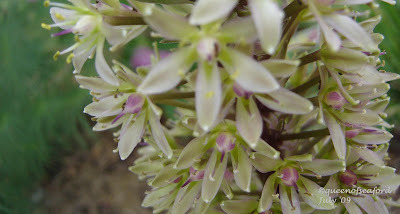 Given the time of year I took these pictures I was not able to get one of the features of the Sourwood-- white panicles of blooms. These little flowers look like lily of the valley blooms. 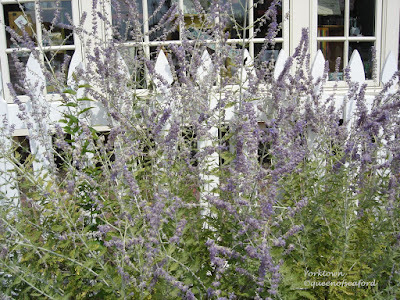 Bees love these blooms. 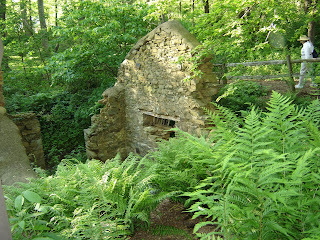 Sourwood honey is a coveted variety of honey. After the blooms there are brown capsules, seed pods that hang on through the winter. 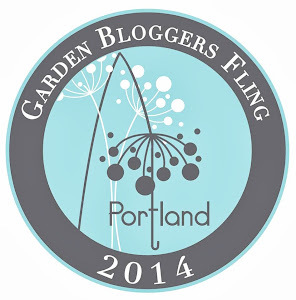 Click here and see some great shots of the blooms in Fairegarden's garden. Thanks Frances!! To me the leaves are another part of the tree that help me make that identification. 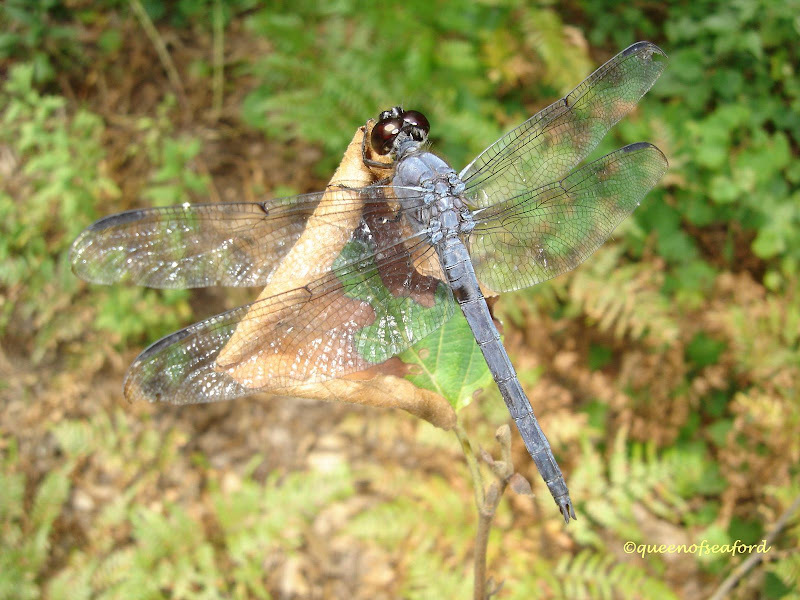 The leaves are alternate, deep green, ovate, and large- according to Michael Dirr, 3-8 inches in length. The fall colors on this tree range from deep red to orange to yellow. 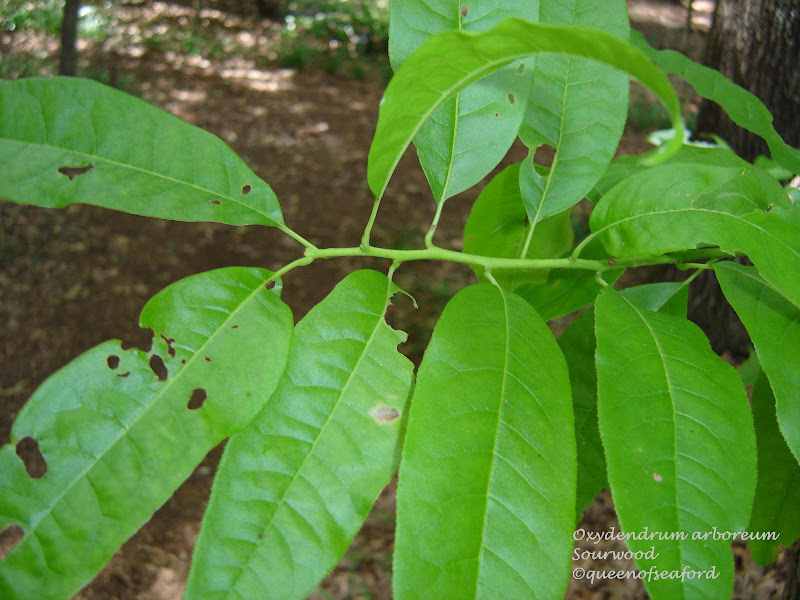 Do you have Oxydrendrum arboreum in your area? One certainly worth giving a second look. 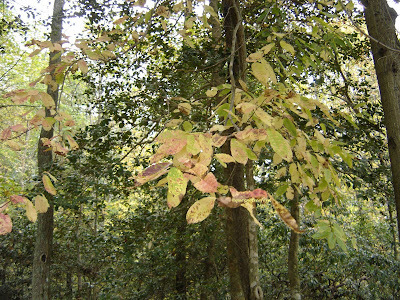 Our Sourwood hasn't had a very good fall color for some reason, but here is a photo of the remaining color. 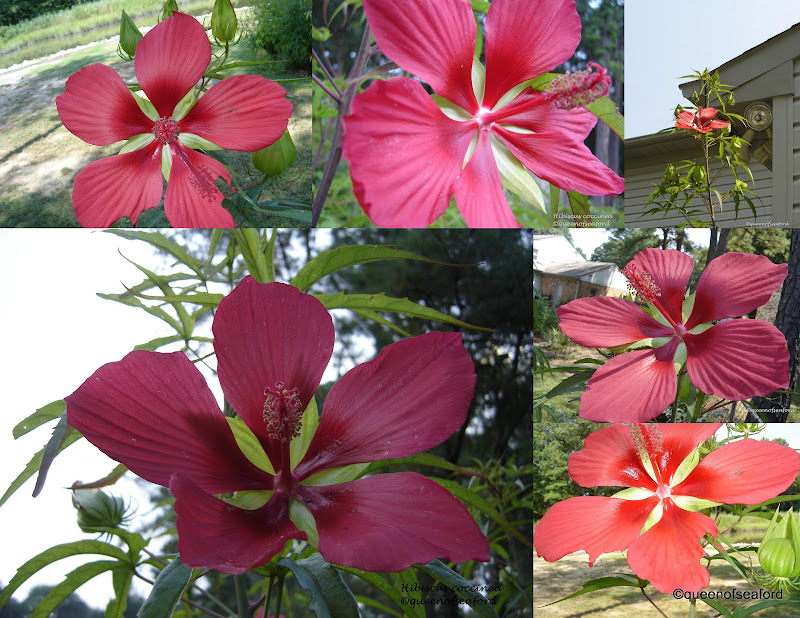 This is Texas Star, Hibiscus coccinea. Other common names are Scarlet Hibiscus or Swamp Hibiscus. This is a hardy Hibiscus that is salt tolerant, which is a bonus for me. Additionally they don't mind wet feet nor drought conditions. In the winter this plant dies back to the ground. I often leave the dead stalks until I see new growth the following spring, just as a reminder there is a plant in a certain spot! These great big red blooming flowers are in multiple places in my backyard. The birds spread the seeds as well as germinating where they drop from the stalks. 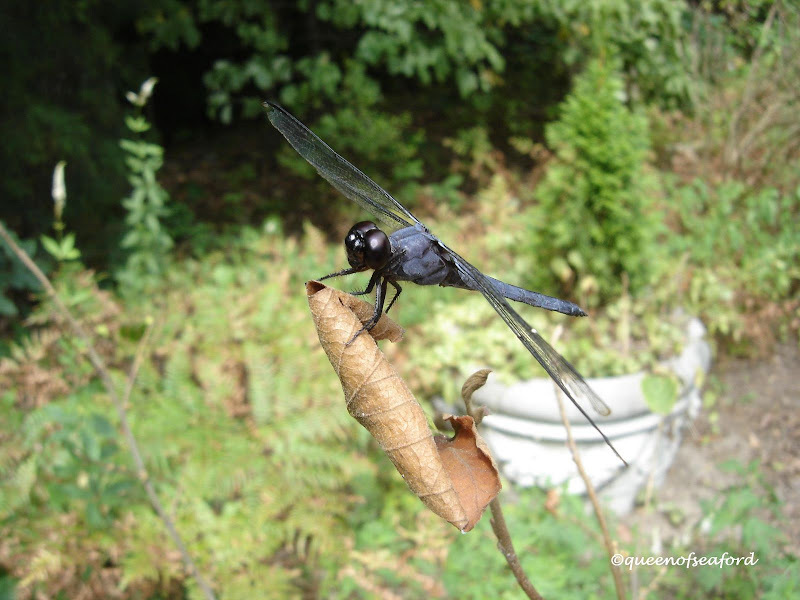 The leaves are deeply palmated --often looked at a second time ---some think I am growing something else! There is one at the corner of the house that is tall....VERY TALL! At this time it is 10 feet 2 inches tall. The goldfinches love this seed in the fall. The hummingbirds check out the red flower quite often as well. Other 'Reds' in the landscape include the Canna, Caladiums, Petunias, Snapdragons (I am surprised these are still going strong! 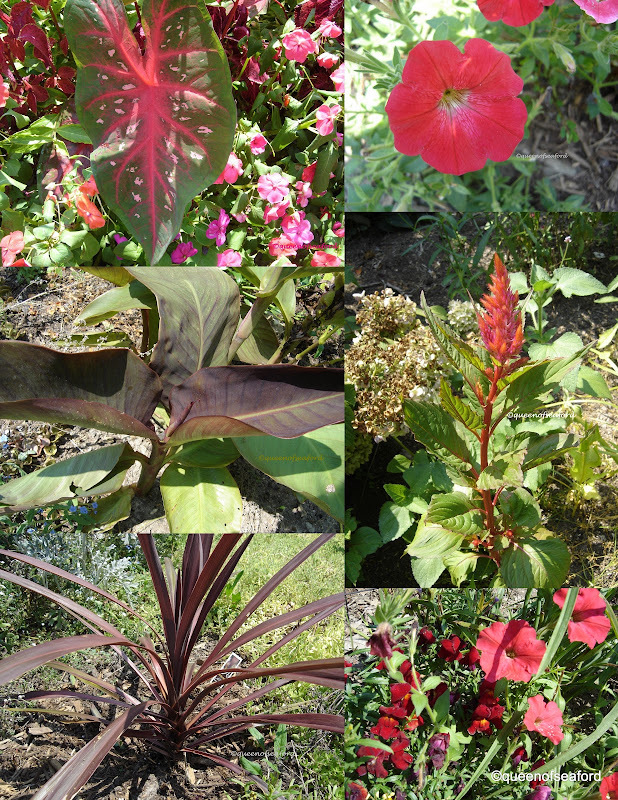 ), celosia, and a couple Cordylines (Spikes). Amazing that each season has a dominate color. This season is RED!! 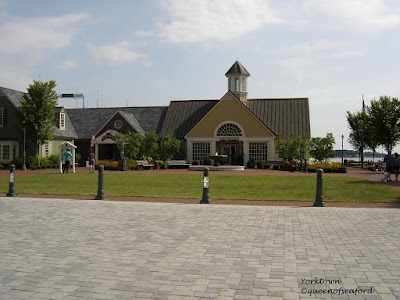 I took this picture outside the Academy of Ballet Studio in Hampton after class. 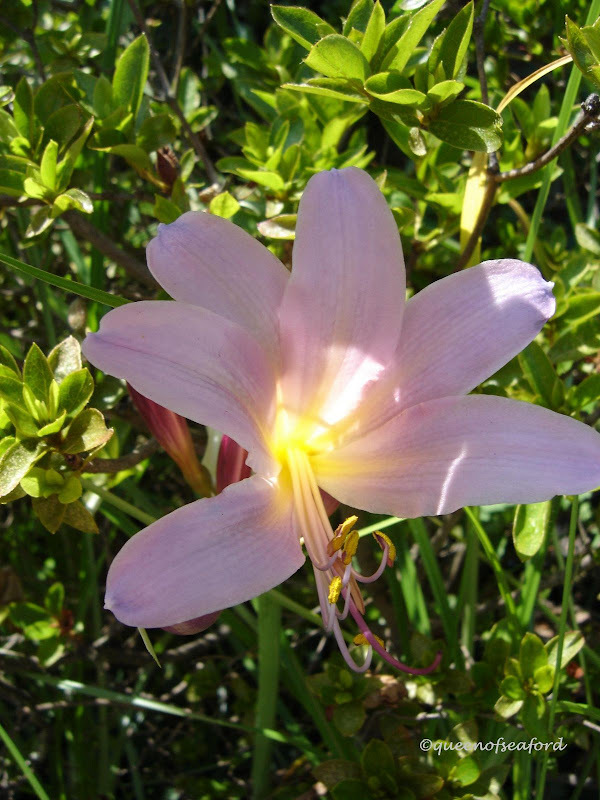 Sure is a pretty lily....but no one knows anything about it. What the........??? Bunny hunting!!! Or was it a toad? One of my goals in the past year or two has been to be able to learn more about trees. I know I mentioned this a while ago when I shared the books that I used to make my identifications. Click here to see. In order to further my knowledge base a tree will be profiled each Tuesday, starting next week, with photos and information about said tree. 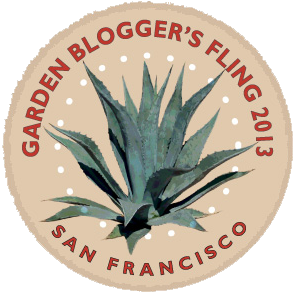 This is my approach to gaining more horticultural information, one piece at a time. It is my hope that you will read along and perhaps learn about a tree or two. While reading through one of the books last night I read about a method to measure the height of a tree. Part of the process in knowing about a tree is to know how tall it is OR how tall it can become. Today I will be using this technique to see if I can get a rough idea how tall my Crape Myrtle is. 2. Stand where you can see the top and the bottom of the tree. 3. With the stick held vertically at arm's length, line up the top of the stick with the top of the tree and the bottom of the stick with the base of the tree. You will need to move towards the tree or away from the tree to get it to be a good fit. 4. Once you are in the correct place for the stick and the tree to line up, mark this spot on the ground (mark where the stick is not your feet). Using a measuring tape, measure from the mark to the tree -- that distance it the height of your tree. 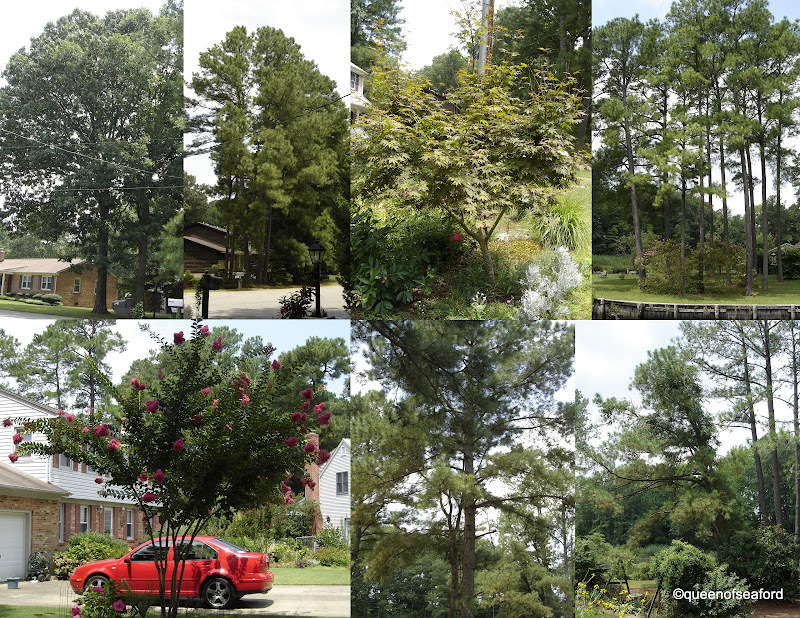 Around my house are mostly very large pines. Some of my neighbors have some very mature oaks but I will not measure them today. Since I mentioned my Crape Myrtle 'Tuscarora' in the last post --that will be the one I measure. You can see a side view of it in the collage. It is about 13 and 1/2 feet tall. There is a narrow strip of land in between our driveway and my neighbor's driveway....which is my mom's house. It is a pie shaped piece of land that at the street is as wide as my mailbox and opens up to be about 15 - 20 feet wide at our gate. When we moved here there were a couple of old pine trees in the middle. 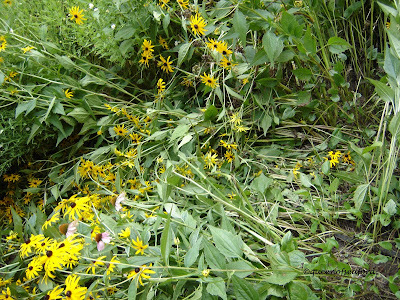 As fate would have it, we had them taken down the week before Hurricane Isabel hit our area. They took other trees out as well. It was fortuitous to have removed those as they were riddled with an ant colony in the center. The prevailing winds would have knocked these trees down on our garage/ house. After the removal of all the roots, I needed to plant a garden of some sort there. I did a raised bed with a Crape Myrtle in the center--Lagerstroemia indica 'Tuscarora'. 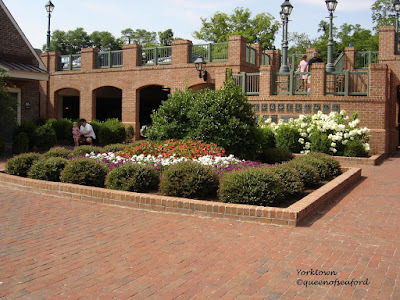 To keep the area planted with similar colored plants, I tried to stay with the dark pinks and reds. You can click on the collage to see more detail. 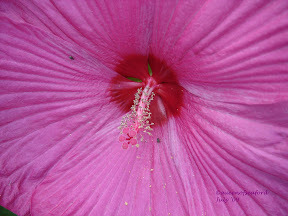 Included in this planting area is a Hibiscus moscheutos 'Luna Series' which is dark pink. I love these dinner plate sized blooms. It is the same color as the Crape Myrtle. By the house is a Gardenia 'August Beauty' and a lot of volunteer impatiens. 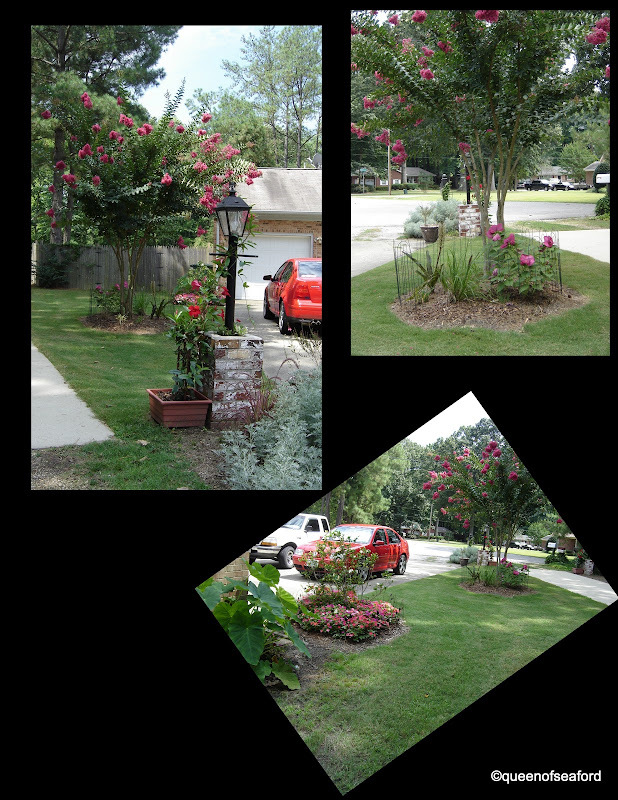 The red and pinks of the impatiens echo the colors of the Crape Myrtle and the Hisbiscus. 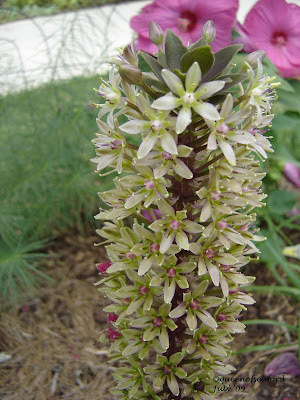 Additionally the Pineapple lily is in that bed. It is really changing as it blooms! I have a Pennisetum and a couple Carex in the bed as well. 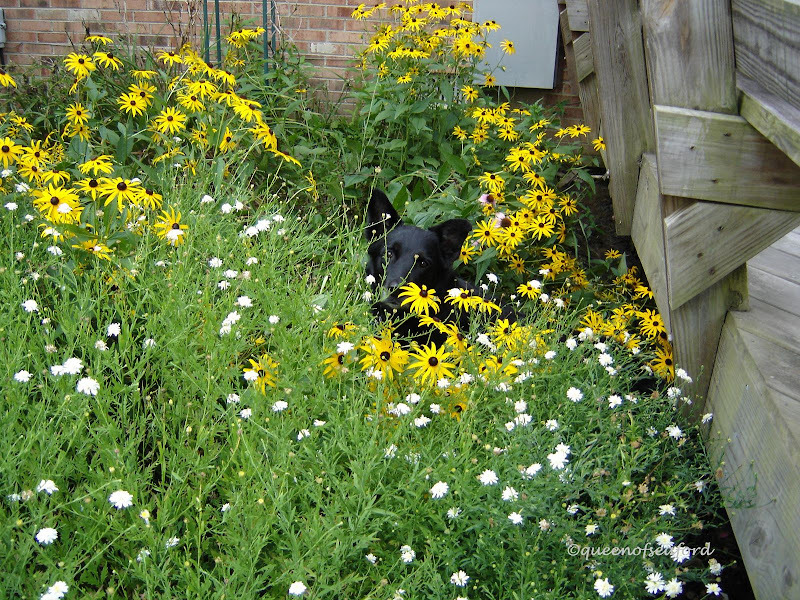 The fencing is not to keep the bunnies out, but to keep the stampeding dogs from running through the plants and breaking them. 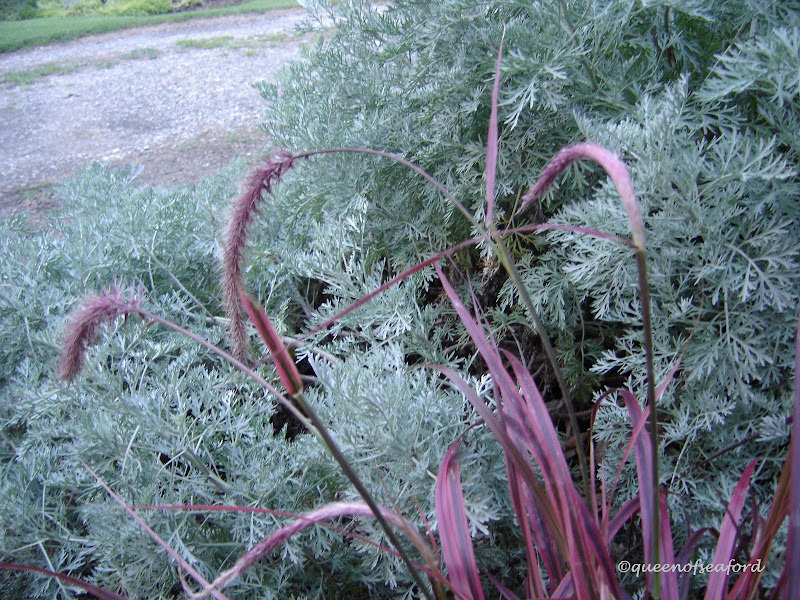 Up by the mailbox is one Artemisia 'Powis Castle' and the new Pennisetum 'Fireworks'. 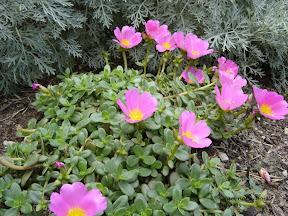 In front of the Artemisia is a sweet little Portulaca...great blooms! I am quite pleased with how this section of the yard is looking right now. Hope you enjoyed the mini-tour! Today's 'critters' were a bit nicer to see. Randy... need an ID please! He was kind enough to continue to pose while I took more pictures! 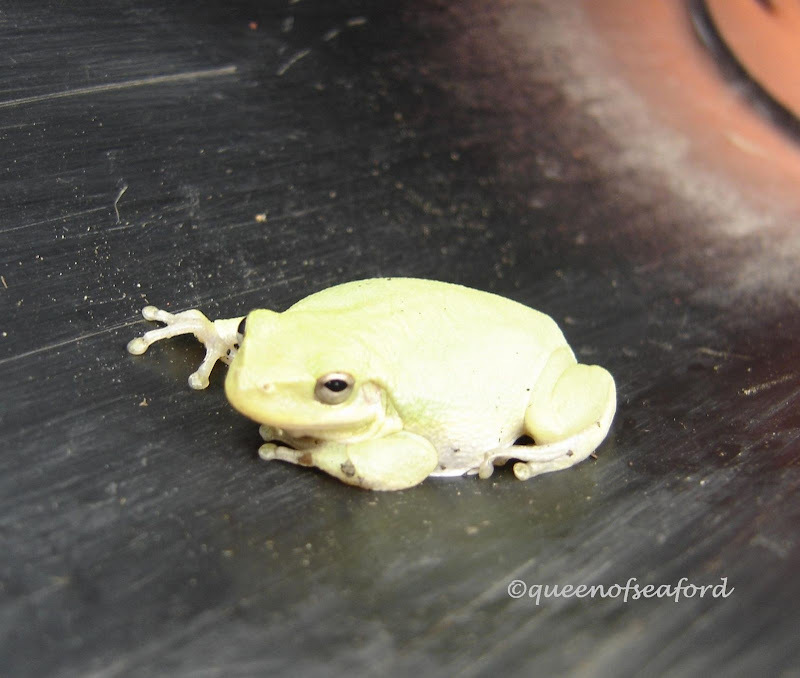 The last one was inside the post hole digger that was stored inside our shed. A nice tree was found for him. Hard to believe it is already July 15th! There is so much color in my yard this time of year. 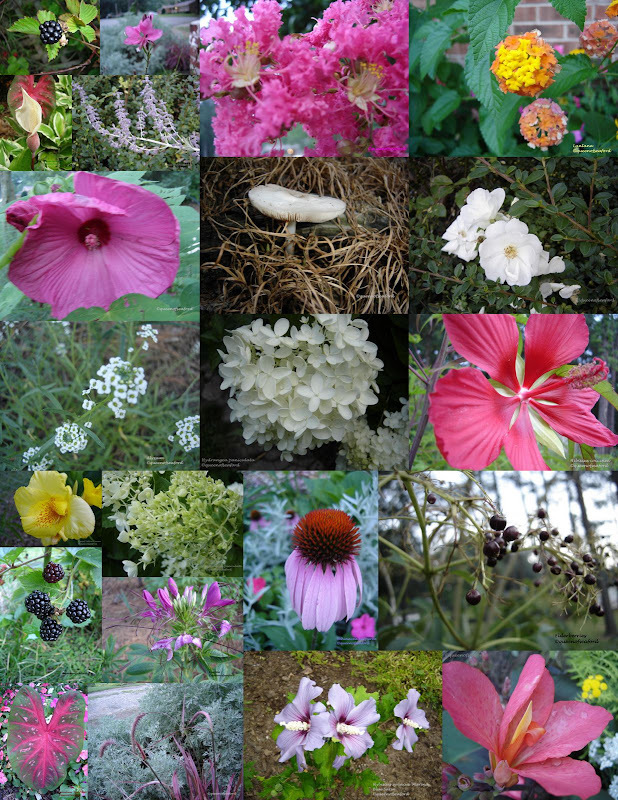 I thought the easiest thing to do would be to put up a collage of current blooms and berries. From the upper left hand corner- Rubus argutus Navaho (thornless blackberries),Gaura lindheimeri 'Ballerina Rose', caladium bloom, Perovskia atriplicifolia (Russian Sage), Lagerstroemia x.Tuscarora (Crape Myrtle), Lantana camara 'Miss Huff', Hibiscus moscheutos, some 'fun guy', Rosa 'Carpet Rose' white, Lobularia maritima (Sweet alyssum), Hydrangea paniculata, Hibiscus coccinea 'Texas Star', Dwarf Yellow Canna,H. paniculata, Echinacea purpurea (Purple Coneflower), Sambucus (elderberries), more blackberries, Cleome (Spider Flower), Caladium 'Red Flash', Pennisetum setaceum rubrum 'Fireworks' & Artemisia 'Powis Castle', Hybiscus syriacus 'Marina' (Rose of Sharon 'Blue Bird'), Dwarf Red Canna. Be sure to click on the collage and make it larger. 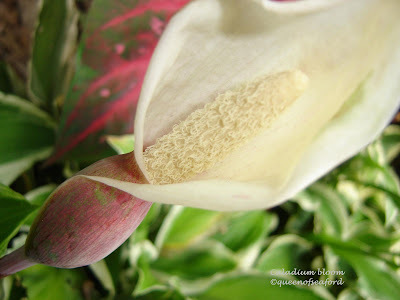 Here is an interesting bloom-- a Caladium bloom. 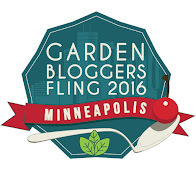 As always, it is time to check out the other garden blogger's blooms---head over to Carol's web site May Dreams Gardens. What does one do on a Saturday morning? 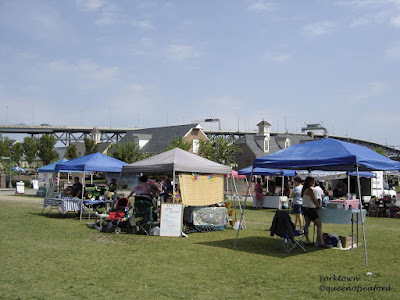 If you are in the Yorktown area, you can go to the waterfront in old Yorktown and enjoy the market. 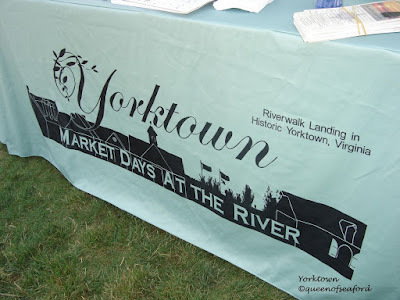 For the past few years Yorktown has a market through the summer and late into fall. 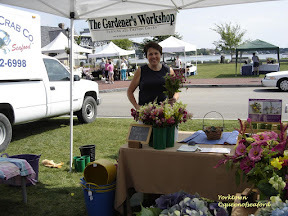 One not only finds Virginia Grown produce, but information, flowers and music! 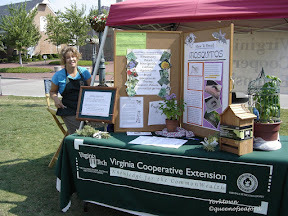 The York County Cooperative Extension Office has a table full of information, staffed today by the lovely Jean, one of the York County Master Gardeners. 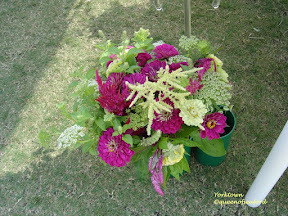 The Gardener's Workshop owner Lisa Ziegler has buckets of blooms...one bouquet lovelier than the next. Stop by Lisa's website. 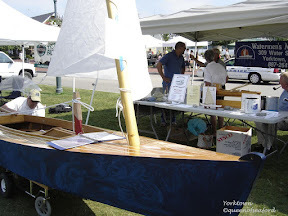 Tell her you came by way of the Queen of Seaford's web site. 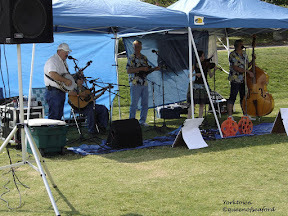 Music is offered by local artists and really completes the experience. and the Coleman Bridge... heavenly breezes blow in from the water. 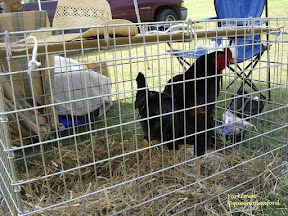 For all our livestock buddies...there are even some chickens on hand! The entire waterfront is lovely. 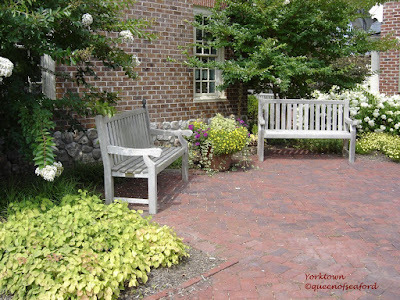 There are benches in nooks and quiet places to enjoy the water or the flowers or people watching! And when you are ready to leave... head over to the parking garage.